What if you had magic fingers and could touch a place on a person’s body and make all their pain and anguish disappear? This would be the stuff of legends, myths and miracles! 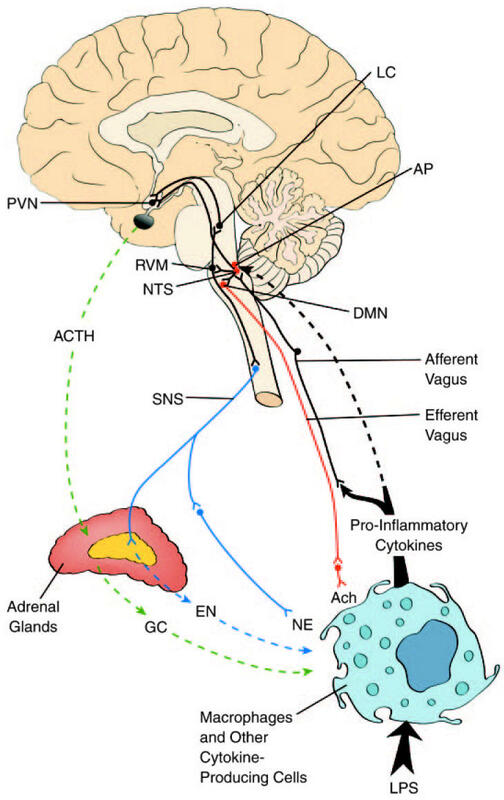 Here’s a research review by Kerry J Ressler and Helen S Mayberg on the modern ability to electrically “touch” the Vagus Nerve. The article, Targeting abnormal neural circuits in mood and anxiety disorders: from the laboratory to the clinic discusses a number of “nerve stimulation therapies” wherein specific nerve fibers are electrically stimulated to relieve mental anguish associated with (drug) treatment-resistant depression. Vagus nerve stimulation therapy (VNS) is approved by the FDA for treatment of medication-resistant depression and was approved earlier for the treatment of epilepsy20. … The initial reasoning behind the use of VNS followed from its apparent effects of elevating mood in patients with epilepsy20, combined with evidence that VNS affects limbic activity in neuroimaging studies21. Furthermore, VNS alters concentrations of serotonin, norepinephrine, GABA and glutamate within the brain22–24, suggesting that VNS may help correct dysfunctional neurotransmitter modulatory circuits in patients with depression. This stuff is miraculous in every sense of the word – to be able to reach in and “touch” the body and bring relief – if not bliss – to individuals who suffer with immense emotional pain. So who is this Vagus nerve anyway? Why does stimulating it impart so many emotional benefits? How can I touch my own Vagus nerve? The wikipedia page is a great place to explore – suggesting that this nerve fiber is central to the “rest and digest” functions of the parasympathetic nervous system. As evidenced by the relief its stimulation brings from emotional pain, the Vagus nerve is central to mind-body connections and mental peace. YOGA is a practice that also brings mental peace. YOGA, in so many ways (I hope to elaborate on in future posts), aims to engage the parasympathetic nervous system (slowing down and resting responses) and disengage the sympathetic nervous system (fight or flight responses). Since we all can’t have our very own (ahem) lululemon (ahem) vagal nerve stimulation device, we must rely on other ways to stimulate the Vagus nerve fiber. Luckily, many such ways are actually known – so-called “Vagal maneuvers” – such as holding your breath and bearing down (Valsalva maneuver), immersing your face in ice-cold water (diving reflex), putting pressure on your eyelids, & massage of the carotid sinus area – that have been shown to facilitate parasympathetic (relaxation & slowing down) responses. But these “Vagal maneuvers” are not incorporated into yoga. How might yoga engage and stimulate the Vagal nerve bundle? Check out these great resources on breathing and Vagal tone (here, here, here). I’m not an expert by any means but I think the take home message is that when we breathe deep and exhale, Vagal tone increases. So, any technique that allows us to increase the duration of our exhalation will increase Vagal tone. Now THAT sounds like yoga! Even more yogic is the way the Vagus nerve is the only nerve in the parasympathetic system that reaches all the way from the colon to the brain. The fiber is composed mainly of upward (to the brain) pulsing neurons – which sounds a lot like the mystical Kundalini Serpent that arises upwards from within (starting at the root – colon) and ending in the brain. 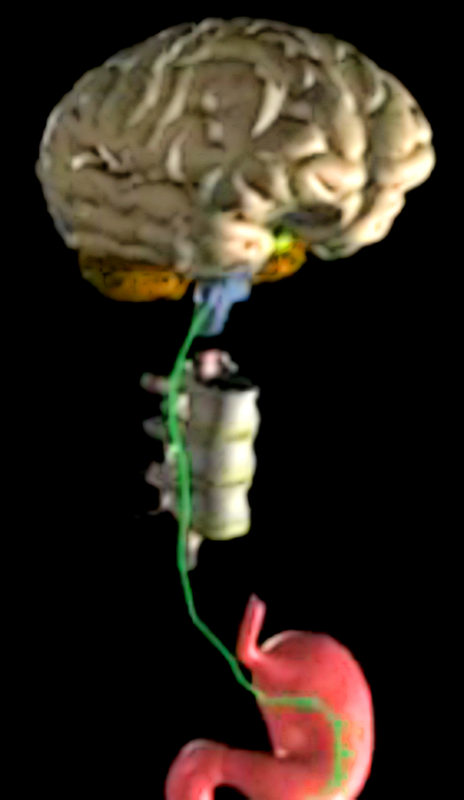 The picture above – of the Vagus nerve (bright green fiber) – might be what the ancient yogis had in mind?